Located in the Heart of Western North Carolina. 10 Minute drive to historic Hendersonville. 25 Minute drive to downtown Asheville. 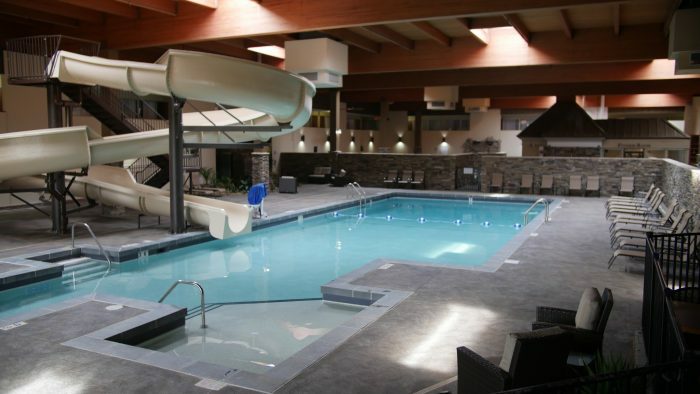 Experience Indoor Waterfalls, Greenery, and an indoor waterslide at the Resort. Nearby Access to Waterfalls, Hiking, Biking, and Many Other Outdoor Adventures. We commit to provide excellent customer service to a bring a quality stay to all of our guests. We seek to provide exceptionally memorable experiences for couples and families. Hendersonville (“the city of Four Seasons”) is a historic city located right in the heart of Western North Carolina. The city is home to several tourist attractions including a gem mine, museums with a Tyrannosaurus skull and antique airplanes, main street dating back to the early 19th century and restaurants with painted bears. Hendersonville is surely a perfect place for your next family vacation. Tucked away in the Mountains, yet located conveniently off Interstate I-40, Hendersonville is known for its outdoor adventures, local brews and dining, and lush apple orchards. Come take a helicopter ride, face white water rapids, or experience the beauties of Chimney Rock and other surrounding parks.